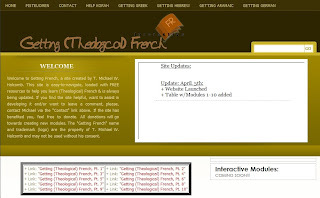 Today, I'm proud to announce the launch of my latest theological language site: Getting French. With only a day left before I head to Africa, I wanted to launch it before I took off because I did not know when / how often I'd have internet access abroad. 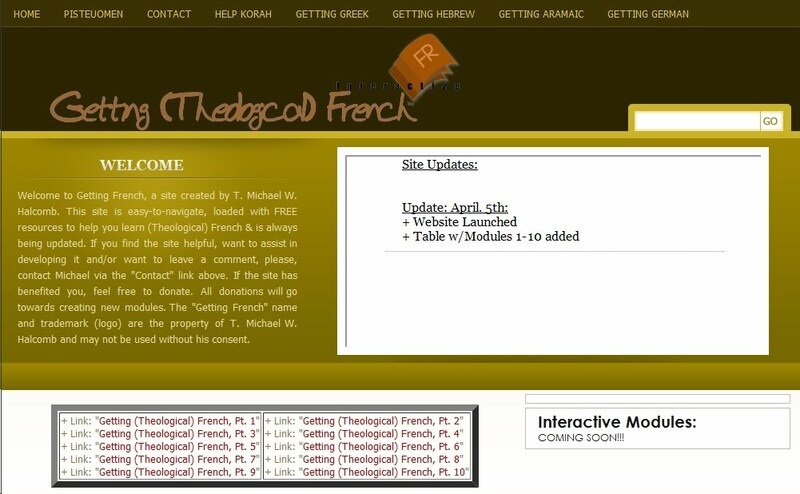 Anyway, like my other language sites (Getting Greek, Getting Aramaic, Getting German), this one is easy-to-navigate, is (soon to be) loaded with FREE resources to help you learn (Theological) French & will, as frequently as possible, be updated. If you find the site helpful, want to assist in developing it and/or want to leave a comment, please, contact Michael via the following link: Contact. If the site has benefited you, feel free to donate. All donations will go towards creating new modules. The "Getting French" name and trademark (logo) are the property of T. Michael W. Halcomb and may not be used without his consent. By the way, I just got word a couple of days ago from my host provider that GettingGerman.com needs renewed. If someone would be willing to donate the $8 to keep that site going for another year, please, go HERE. If not, the site will go down for a while as I will not have time to maintain it while in Africa for the next month.